Affinity purified against recombinant protein, then deleted against GST. 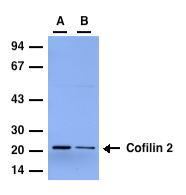 HeLa (lane A) or HEK 293 (lane B) cell extracts (20 μg of each) were separated by SDS- PAGE, transferred to nitrocellulose membrane and blotted with the anti-Cofilin 2 antibody at 1 μg/ml. Binding of the primary antibody was detected using rabbit peroxidase conjugated anti-sheep IgG antibody (1 in 10, 000 dilution, Pierce) followed by enhanced chemiluminescence (ECL, Amersham).